Cathy at Rambling In The Garden invites us to share an arrangement every Monday using materials collected from our gardens. The garden is happy this month—more peonies are flowering and my heirloom rose opened this week. Each peony is so large as to fill a vase just on its own. When gathering them I cut their stems short so as to leave as many buds as possible on the shrubs. This made it difficult to arrange them. 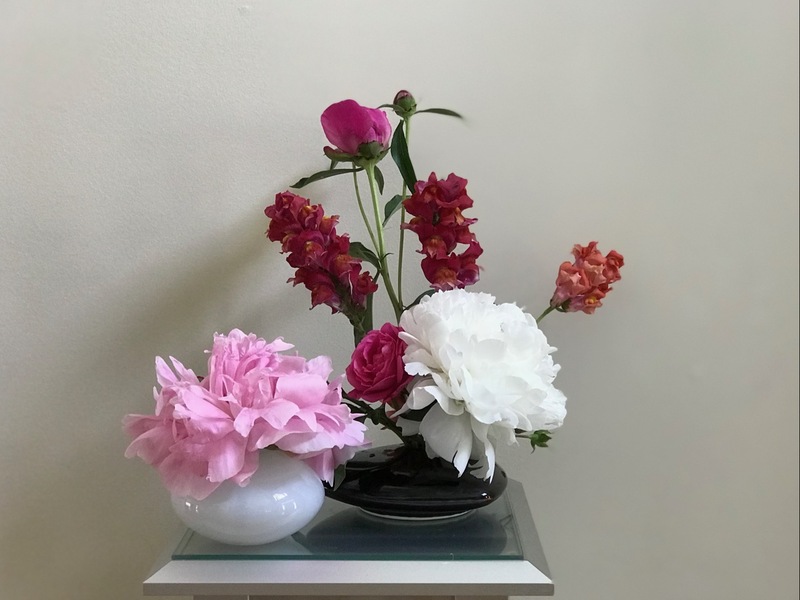 I thought I would use one each of Paeonia ‘Festiva Maxima,’ ‘Pink Parfait’ and ‘Madame Emile Debatene’ but there was not enough room in the Ikebana vase I had chosen. Even replacing one with Iris germanica ‘Immortality’ gave the vase a crowded look. I decided to rework the vase using roses if I had time later, so eventually I started over. The old-fashioned rose is the fullest in several years. My mother’s first cousin shared this rose with me many years ago and I brought it to this garden 17 years ago. My mother and her mother also grew this rose, as did my daughter for a couple of years before she moved to California. She is visiting us this week with her husband so has been able to enjoy the garden as it reaches its peak. Just as I began cutting the roses we had a downpour, so I only had a couple to use. The roses ended up on the left side near the base. ‘Madame Emile Debatene’ made a come-back at the upper middle of the design, just a slightly open bud, and this time with a long stem to provide some height. Here is what it looks like when opened more fully. ‘Festiva Maxima’ is anchored on the right. 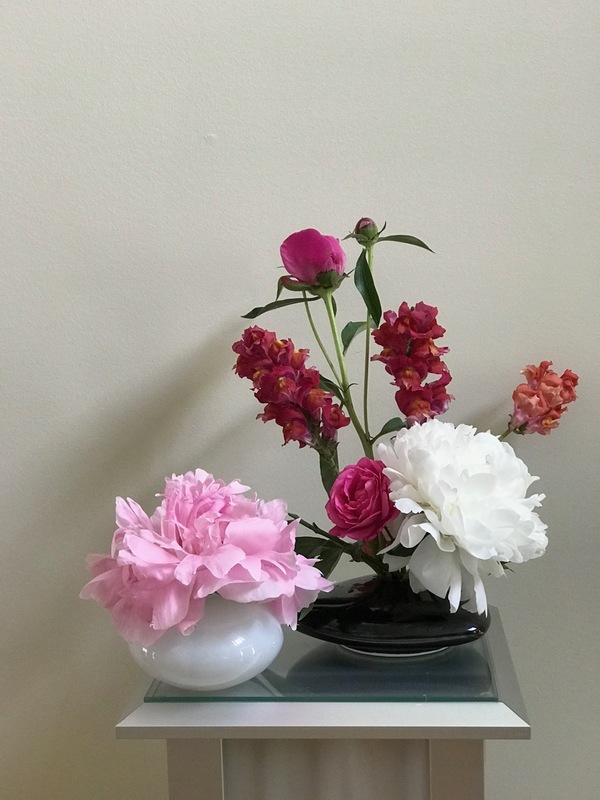 I did not have time to gather more flowers, but I could have used two or three more roses to offset the size of the white peony. Several stems of sunrise-hued snapdragons enhance the color palette and add texture. I was not completely satisfied. I still wanted to use the third peony, Paeonia ‘Pink Parfait,’ so I found a way and I think it helped balance out the design. 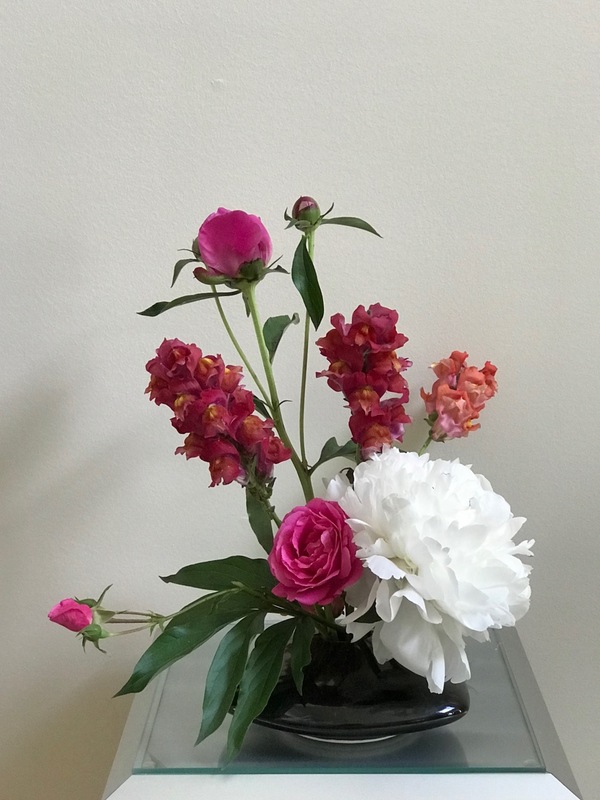 This entry was posted in garden and tagged 2018vase, Antirrhinum majus (Snapdragon), flower arranging, flower design, in a vase on monday, nature photography, old-fashioned rose, Paeonia 'Pink Parfait' (Pink Parfait Peony), pass-along plant on May 7, 2018 by pbmgarden. 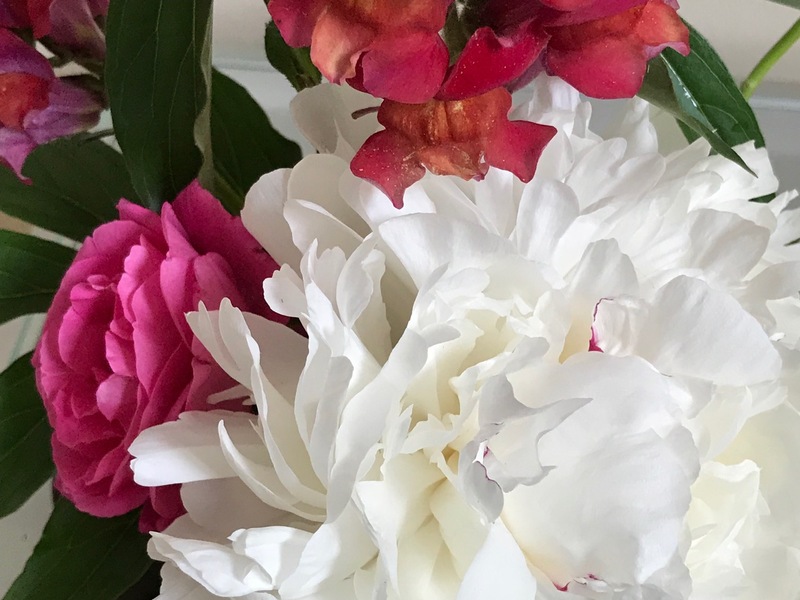 I barely noticed the scent when working with these peonies yesterday but this morning the perfume greeted me when I came into the room where the vase resides. Hope yours don’t keep you waiting too long Judy. you are very good to share your precious peonies with us in your vase. I’m completely hopeless at using short stems in a design so I will, as always be looking at yours for inspiration. Have a wonderful time with your daughter. The peonies are having a banner year after the invigorating cold winter, so they seem less precious than in years past. I’m going to save a few buds in the refrigerator for later too. We have planned a special day together–so good to see her! I love your arrangement. I live in a different part of the South, but we also had lots of rain and cold this year and many of my plants have come back super-sized. Maybe the harsh weather was a good thing. Thanks! Yes, it was a rough winter but maybe we’re seeing the benefit now. A lovely selection. I’m looking forward to my peonies. I think the first one is about a week away, so I will have to be patient. Thanks Ali. Keep a close eye on your peonies. They seem to suddenly jump into action. Enjoy. Those big fluffy peonies are divine! 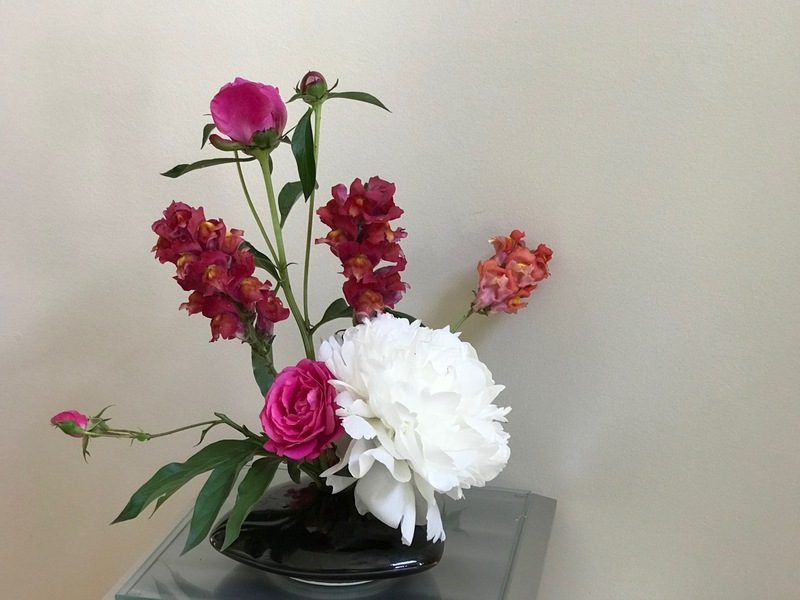 The richly-hued snapdragons and roses complement them perfectly in the Ikebana vases. 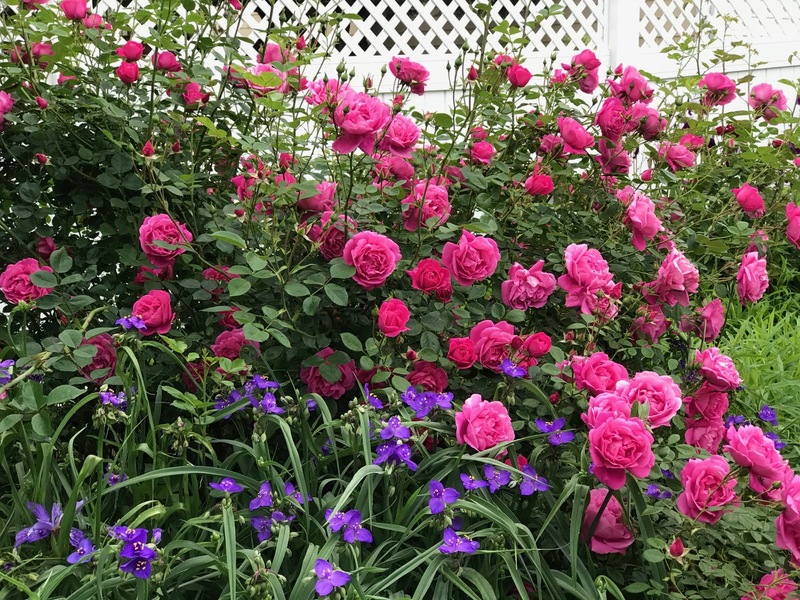 Loved seeing your rose bushes as well–so pretty. Thanks Terri. The snapdragons have survived in the garden for 2-3 years and make a good impact in the garden. 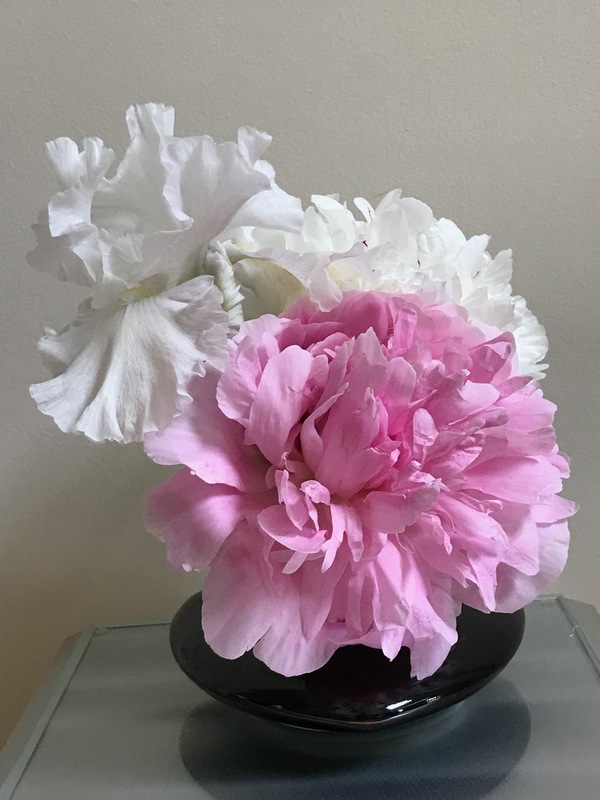 When I saw this yesterday on IG I was bowled over….those peonies are fabulous and I loved the addition of the snaps and roses….what a beautiful vase with a heady fragrance I would guess. Thanks Donna. The fragrance is pleasant, not too overpowering. This really does make the most of the blousy beauty of each Peony. Gorgeous. Thanks Alison. 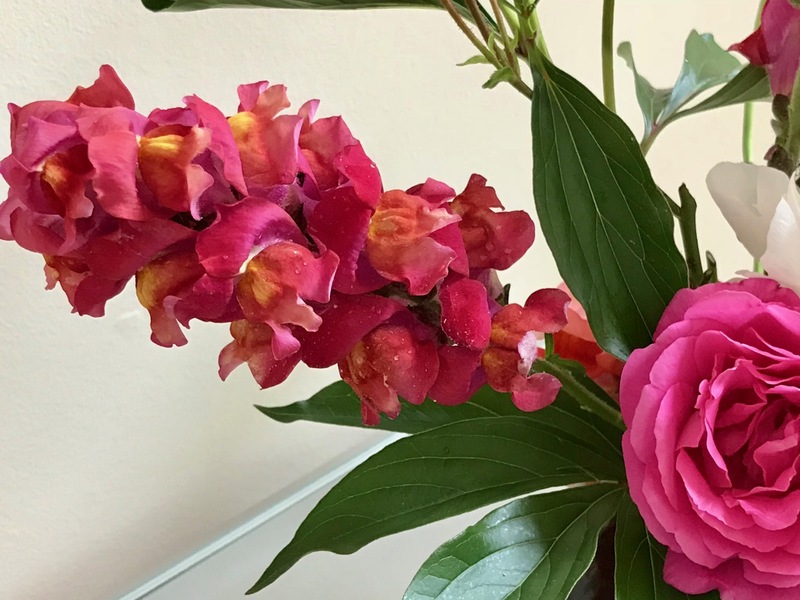 Peonies are challenging in an arrangement if you start with a bud because there is such a huge size-shift once they open. I do not grow peonies, but if I did, ‘Festiva Maxima’ would be my favorite. I know that there are better whites available, but ‘Festiva Maxima’ is the epitome of peony. (That sounds funny.) Even with the red specks, it is the perfect white. I was sent this ‘Festiva Maxima’ through a mixup in the order, but it’s been rewarding. Not many peonies are available in nurseries here, but this used to be the most common of the whites. I still think it is the best here. 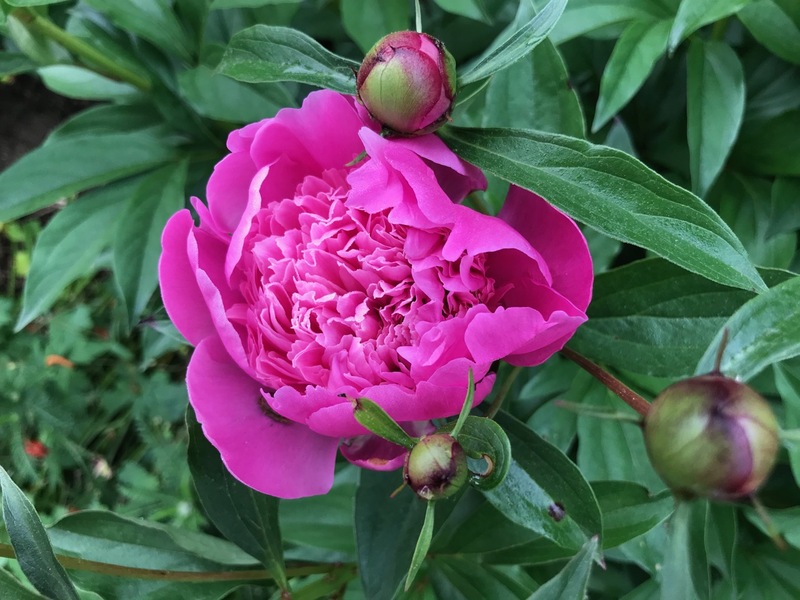 I ADORE peonies – I can’t wait for mine to bloom! Hope your peonies shower you with blooms this year Eliza. I’ve been amazed by these this year. I hope so! They are just a few inches high at this point. Anticipation! Beautiful rose and peonies – my white peony is also Festiva maxima, but not flowering yet. I love that pink one and the white iris you started off with too. Thanks Cathy. The peonies have outshone the irises this year. I think I need to divide the irises. Just lovely! Those are late June or July flowers here. I love all peonies (who doesn’t!) and your heirloom rose is so special! Interesting your peonies come much later Joanna. They would swelter in our late June/July heat, although it’s going to be 94F here today so mine won’t last much longer. There are never too many peonies for me! Love these colors together and that iris is a stunner! I’m late getting to know how wonderful peonies are. This has been a spectacular year for them–my refrigerator is full of buds! Your arrangement really highlights the lushness of the peonies! Enjoy your company, the roses look great. Thanks Frank! We had a great visit with our daughter, over all too soon. The roses have made me happy this year! Another work of art. I’m not sure I could cut the peonies but then I don’t have to face that quandary. Hi Kris, thanks. The peonies outdid themselves this year. Just catching up on blog comments. Have caught glimpses of you in several fling photos and am looking forward to finding time to sit down and catch up on the Fling gardens this year. I’m fairly new to the joys of peonies but I think you’ll be rewarded if you grow them. The two peonies and ‘Immortality’ iris arrangement is so perfect. Glad you liked that arrangement P. I believe you actually ID’d that immortality for me as it was a pass-along. It seems like all color rules can be thrown out during Spring when everything is lush and so much is happening.